This Friday, October 30, the Pulitzer Foundation for the Arts (3716 Washington) opens Urban Alchemy/Gordon Matta-Clark from 5:00 – 9:00 p.m. Matta-Clark (1943-1978) trained as an architect but ended up as an artist working architecturally. That is, Matta-Clark took to buildings to create his art. Literally. Matta-Clark cut sections of buildings, cut pieces out of and into buildings and rearranged and played with existing architecture. Out of his brutal dissection emerged works that raise more questions about the contemporary urban condition than can ever be answered. The Pulitzer’s press release contains an evocative quote from the artist, who said that his work engaged buildings “for these comprise both a miniature cultural evolution and a model of prevailing social structures. Consequently, what I do to buildings is what some do with languages and others with groups of people: I organize them in order to explain and defend the need for change.” Matta-Clark’s buildings were slated for demolition and already deemed trash to the modern capitalist economy. From their doomed bodies, Matta-Clark raised out “hope and fantasy” that challenged perceptions of the firmness and commodity of the built form. Matta-Clark worked in the early 1970s when urban renewal’s bulldozer binge was at its peak. In this time, famously, salvager Richard Nickel in 1972 met his death saving intact pieces of Louis Sullivan’s Stock Exchange Building in Chicago. Matta-Clark’s death only six years later was due to cancer, but there is some mystic coincidence in the untimely deaths of the artifact-seeker and the playfully artistic vivisectionist. Both met the same fate as so many of their subjects did, in the period where American cities lost more historic architecture than ever before or since. 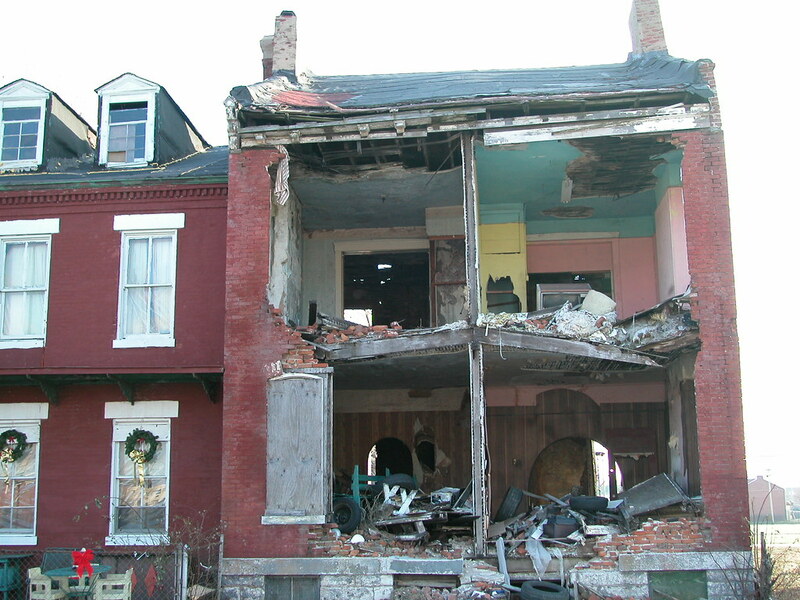 The arrival of the work of Matta-Clark in St. Louis in 2009 evokes another coincidence: the arrival of the exhibition at a great moment in the historic redevelopment of north St. Louis, when Paul J. McKee Jr. is attempting to reinvent urban renewal as a private-side endeavor, with his own company leading and government following. The old model is inverted, but historic architecture — and the social relationships its endurance enables — is as much at risk as it was when Matta-Clark was at over work thirty years ago. The image that I share above is not the result of McKee’s ongoing effort, but it could be. The NorthSide project has created more cut-through buildings than Matta-Clark made, or Nickel ever entered, through the dollars-and-cents underground economy of brick theft. In the past two years, St. Louisans have seen — or, perhaps more commonly, seen images of — buildings gruesomely reinvented at the hands of people needing quick money to pay a bill or get a fix. The horror is unimaginable for those who live around the shells that haunt north city. Can the aesthetic counterpart found in Matta-Clark’s work draw from this region’s citizens a meaningful discussion on the future of our own historic architecture? Matta-Clark’s work has the power to provoke, inspire and motivate us to move from our own complacent disregard for the inner city. May we not sublimate what is lived as a crisis. This entry was posted in Abandonment, Art, Events, North St. Louis, Northside Regeneration. Bookmark the permalink.